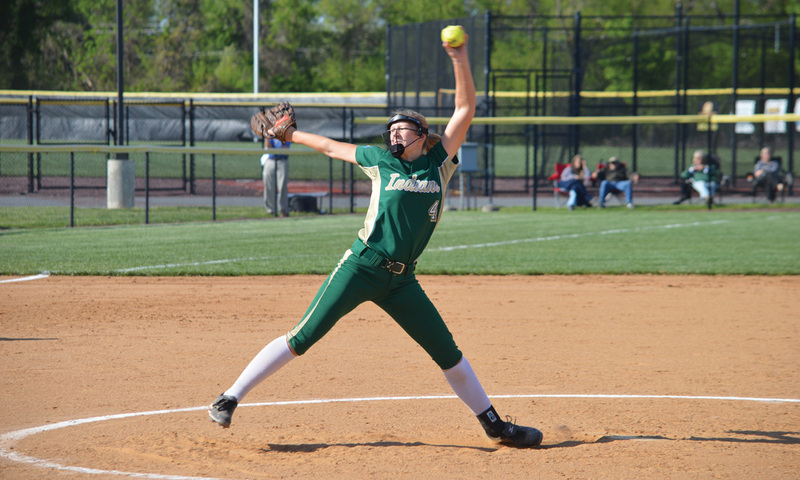 Junior pitcher Abby O’Shields gets ready to fire the ball during Tuesday’s game against Milford. Teammates surround O’Shields following a strikeout during Tuesday’s game against Milford. When a pitcher can get early run support, it makes life so much easier in the circle. Such was the case on Tuesday afternoon, May 8, for Indian River High School junior Abby O’Shields. The southpaw tossed a complete-game, one-hit shutout at the defending state champions, Milford, closing with an 11-0 win. It was a victory made all the sweeter because IR had lost to the Buccaneers in the semifinals last year. Head coach Erika Murphy was elated by the performance of her hurler. Senior leadoff hitter Julia Bomhardt got things going in the top of the first inning with a bunt single. Kayler Townsend followed with a walk. Braydee Whitman then dropped down a bunt single of her own to load the bases. Samie Mayfield knocked in a run with a sacrifice fly, then Damya Williams singled home Townsend to make it 2-0. The early offensive output made things easier not only for O’Shields, but Murphy said she felt like it set the tone and confidence for her team overall. Morgan Bomhardt singled to lead off the second inning, and she moved up to third on Julia Bomhardt’s second bunt single of the game. With one out, Whitman lifted a sacrifice fly to left that scored Morgan Bomhardt and gave the Indians a 3-0 lead. Another run in the third made it 4-0 when Morgan Bomhardt smacked a sacrifice fly to score Williams. The fourth inning saw IR plate two more runs — and with two outs, no less — when Whitman walked and would score on a double to the fence by Mayfield. Pinch runner Taylor Lipkins scored when Williams laced a single to center, and that put the Indians up 6-0. IR threw up a five-spot in the sixth to continue the blowout. With one out, Mayfield was hit by a pitch, and Williams reached on a Milford error. Kaylah Briddell then walked to load the bases. 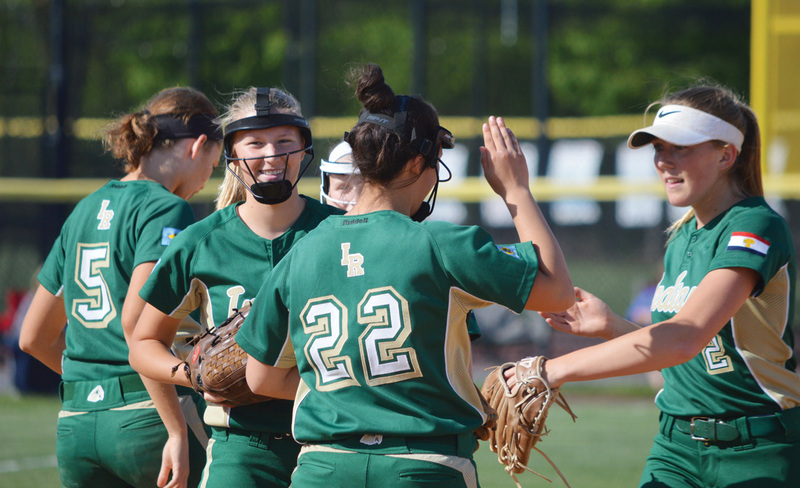 Kathryn Collins walked to score Lipkins; then Grace Snyder picked up a RBI with a sac-fly to score Williams. Morgan Bomhardt’s single scored Briddell. Julia Bomhardt then came up and drove a ball to the fence in right field for a two-run triple. The runs were the exclamation point on an absolutely impressive performance for IR. “Any win feels good,” Murphy said. “We weren’t expecting it. We were just hoping for a win, whether it was by one or by 11. It is what it is. At this point in the season, one win is just preparing us for what’s to come in the playoffs. “We’ve played a couple games where we haven’t come out and played our best game. Right now, we’re just keeping it simple, doing the little things right,” she added. “They know the little things will get us a win. You know confidence-wise, anytime you beat the defending state champs, it’s always gonna feel good for any team that beats them. The win was the third straight for the Indians, and improves their record to 12-4 on the season. Two final home games to round out the regular season start Friday, May 11, with visiting Sussex Central, before a meeting with Caesar Rodney on Tuesday, May 15. Extra bases: Julia Bomhardt, Damya Williams and Morgan Bomhardt each collected three hits in the game for IR. Williams, Lipkins and Morgan Bomhardt also each scored two runs.